← What do I do with Leftover Wine? As a continuation from my earlier holiday post, our Christmas morning always begins with Breakfast Casserole, coffee, and poinsettias’ for those in the mood. Then we sit down later in the afternoon for a Roast Beast dinner. While the recipes here are great for a Christmas feast, I have been known to pull them out for many different family gatherings, as they are simple, and will easily feed a crowd. Breakfast Casserole is an easy “Make the Night Before” creation. The first time I ever had this dish was at a CYO gathering of teenagers, so you know it will appeal to the masses! In 2011 we became rather fond of Monmousseau sparkling for our celebrations. Monmousseau Brut Etoile. This sparking is done in the “methode traditionnelle” and is made of Chenin Blancfrom the Loire Valley (if google translated the french correctly) As is traditional, the secondary fermentation is in the bottle. Its crisp, fruity – aromas of stone fruit, and well balanced. It is a dry sparkling, but an easy sipper. For those of us that enjoy French champagne on a California sparkling budget, this beauty rings in at $14 a bottle. Its available in wine shops in Cleveland, and we get ours from Wine and Design in Tremont. For Poinsettias you combine your sparkling with a cranberry juice. It’s a holiday festive twist on the Mimosa, and I love to use a Cran-Raspberry, which blends well with the drier bubbles. Straight cranberry can be palate drying at times. Our main meal consisted of Waldorf Salad, Standing Rib Roast (aka Roast Beast), the Chef’s Mashed Potatoes, my green beans, and the Chef’s amazing pound cake with lemon blueberry topping. Since she won’t even share the recipes with me, (aka Mom) – I know she won’t let me publish them. But I will give you the Waldorf Salad and Green Beans recipes on the recipes page. Vinoklet’s story begins with Krešo Mikulić immigrating to the United States from his homeland in Croatia, near the Adriatic Coast in the Mediterranean Region. He grew up in the winemaking tradition and Krešo returned to it in 1984. He purchased a dairy ranch in Colerain Township, Ohio and because of its excellent soil conditions and micro-climate, the vineyard produced first samples of wine with great success. They are producing Chambourcin, Concord, Catawba, Traminette and Cabernet Sauvignon. 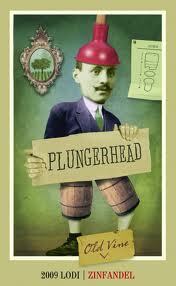 Two things I enjoy about this wine… one – there’s a guy with a plunger on his head on the label. Seriously…. it makes me giggle. Second – the closure on this wine is a Zork. This particular closure is helpful if you open a bottle and will need to close it up for the next day, or place it in the refrigerator. The plastic unwraps and you have your own private “saver closure” on the bottle. When you see these don’t think “cheap wine” – they are a lifesaver when you don’t want to finish your wine. We enjoyed a Waldorf Salad, a cheese and meat platter, and the company while we prepared the balance of the meal. I usually recommend a crisp white with this salad – but in combination with the meats and cheeses – the Zinfandel worked surprisingly well. Then it was time for the Roast Beast. Sides of course were Chef’s Garlic Mash and my green beans. We opened the Thief, a Pinot Noir from the Willamette Valley (that’s “Willamette, Dammit”) in Oregon. 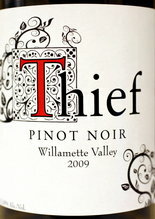 Thief, according to the bottle, is a wine “of distinction absconded from the best vineyard sites in the Pacific North West.” A cute riff on the name, but a lovely medium bodied Pinot Noir – black cherry and just a bit of cinnamon – this Pinot is heavy enough to carry the roast beast easily. At $19.99, I rate the QPR value medium – but one of the better wines I’ve seen in this from this region and in this price range. This was our Holiday meal in a nutshell. I hope you enjoyed the wine and food around your table as much as we did! Posted in pairings, tasting notes and tagged Holiday meals, Ohio wine, Oregon Wine, Pinot Noir, recipes, Zinfandel. Bookmark the permalink.